Last year, I entered the Amazon Breakthrough Novel Award. Needless to say, I didn't win. 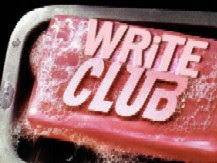 Today, I entered Write Club. It's kind of like March Madness for all of us prose-addled keyboard-lickers out there: your anonymous 500-word writing sample squares off against someone else's, and the winner of that goes to the next round, and so on. I'm keeping my hopes modest, but as with ABNA, what I like about these kinds of contests is that they let you run in a crowd. You know, normally the submissions game is you putting your best-ever in an envelope, dropping it in a black hole, and waiting to hear whether you made the grade. Yes or no. Black or white. You vs. an indifferent universe. Contests like these, though - the ones that run in stages, and show the results for each - let you see how you stack up against the competition. And as with an actual 5k, not everyone there is going for the gold: you might just be out to prove to yourself that you can run the race, or want to see if you can finish in the first 50%, or 20%, or whatever. Because when you think about it, "better than 17 out of 31 other entries" is a hell of a lot more useful feedback than "no." As often as we hear "no" (or more often, nothing at all), it's good to take a benchmark measurement every now and again, and see where you settle in the pack. Failing that, stick around here awhile - GrammatiCats returns on the Fourth of July! Interesting. I'd like to do this, and I have just a small excerpt selected (keeping hopes extremely low haha). I found nothing stating if you send it as a doc file or just copy/paste into the email or anything really. Hopefully I figure out what is wanted and get something turned in. finding out the day OF really puts a crimp on things, but better than not at all! Well, it's way after the fact, but if it makes you feel any better, I submitted it as a Word doc (like they showed in the picture) and it seemed to take okay. I see you got yourself signed up for the club, regardless - here's hoping for the best! I did both actually. Pasted it into the email and sent as a file in the same email noting that there were no specifications and if any issues to let me know. I got a reply back that it was received so seems it worked! I submitted!! This seems fun. Good luck! You too, ma'am - I am so glad I'm going to get to know at least one other person in the game! Non-Write-Clubbers can read the submissions, right? Please say yes. Actually, I should give you my login or something so you can vote. You have way better taste in fiction! I think that panel of judges are reading the entries and then 32 are selected. Those 32 will be viewable as they go head-to-head with one another and be voted on, but only one pairing per week from what I gather.